Puran Poli: Puran Poli is a traditional type of sweet flatbread made in the states of Maharashtra, India during the festivals of ganesh chaturthi or diwali or any other festive occasion. The puran poli is in itself a delicious sweet meal and is often eaten as such or may be served with a spoonful of ghee. Puran poli is also served with flavoured milk, flavoured coconut milk (with nutmeg and jaggery). Soak the split bengal gram for 4-5 hours. Sift wheat flour with a pinch of salt. Knead the wheat flour mixture with warm water, to make soft dough. Cover and rest the dough for 20 minutes. Boil the soaked bengal gram in a pressure cooker with 2-3 tablespoon water. Turn off the flame after 1 whistle. Keep aside the pressure cooker till the pressure self releases. Take out the cooked bengal gram from the cooker. Cool and grind finely in a mixer, without water. Melt 1 tablespoon oil in a frying pan. Add in the ground bengal gram with and powdered sugar (or grated jaggery). Make a small ball of dough, flatten and stuff 2 tablespoon of pooran. Seal and press between your palms (Your puran poli will not break while rolling if you do this). Roll out the stuffed dough ball into a round 6”-7” in diameter with a rolling pin. Put puran poli on griddle. Apply oil on both sides and fry till it turns brown, turning regularly. Fry all puran polis in this manner. Serve hot puran poli with a tablespoon of ghee or flavoured milk. 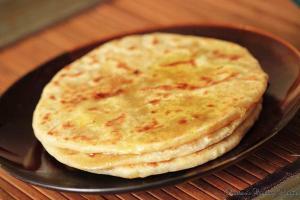 If you have any queries regarding the Puran Poli recipe, please leave a comment.